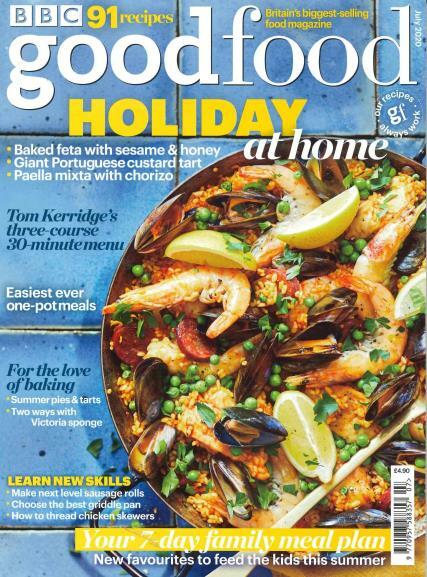 BBC Good Food is the UK’s no.1 food magazine, each issue includesover 80 recipes for quick and easy meals, entertainment and dishes directly from celebrity chefs’ mouths. Buy a single copy or subscription to BBC Good Food magazine. For anyone that has a taste for getting creative in the kitchen, a BBC Good Food magazine is for you. Serving up an exciting mix of seasonal recipes, comprehensive buying guides, interviews with professional chefs and hints and tips on how to produce delicious dishes, the magazine is a big helping of all you could ask for. As the UK’s no.1 food magazine, with each issue of BBC Good Food you can expect over 80 recipes for quick and easy meals, entertaining and dishes directly from celebrity chefs’ mouths. As every dish is tried and tested by BBC Good Food’s own cookery team, you can be guaranteed that they will work. Recipes include all types of food, from classic British, to Greek, to Mexican to special diet dishes such as low carb and gluten free. In addition, BBC Good Food includes a TV section with recipes from your favourite cookery programmes. Readers will savour the wonderful photography which comes with BBC Good Food magazine, whether showcasing cakes or casseroles. Not just food-focussed, you can also learn about wine with articles explaining how to match food to specific wines. Celebrity chefs also provide wonderful time-saving tricks and advice on professional kitchen techniques to help both the novice and seasoned chef. Feast your eyes on a BBC Good Food subscription today and you’ll be left wanting seconds month after month! I first received good food as a gift subscription, I didn't normally purchase it. After couple of months it had filledme with inspiration for new and interesting meals I really enjoyed and looked forward to it coming in the post once a month. It's also great because it's a mag that both me and my partner enjoy reading together! Although the odd recipe is repeated/ slightly tweaked here and there most of the recipes are very original! I missed it so much when the subscription ended and really lacked in dinner inspiration I used my tesco club card points to get another years subscription! Overall I think it's a fantastic mag full of recipes and not ads! This magazine is a must for anyone who enjoys food. The magazine contains recipes for children to the experienced cook. Each recipe is accompanied by detailed instructions and tempting photos. Finally, as a new member of weight watchers I thought that I might as well cancel my subscription but the nutrional information allowed me to calculate my weight watchers points. Now I can enjoy fresh seasonal recipes knowing that they are healthy for me.